Many fanciers dream of winning a national championship title or national ace pigeon title one day. Well, Gino Clicque was able to win both prizes in 2018 alone! 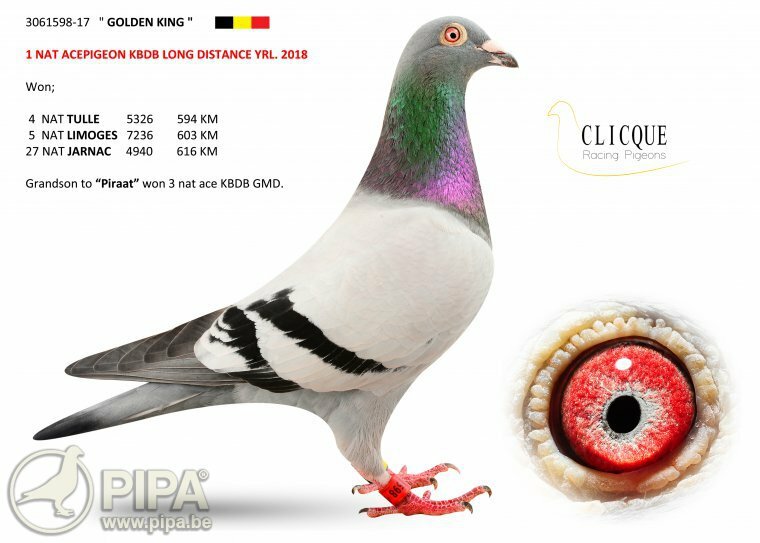 He did even better: he not only won the national championship yearlings in the extreme long distance, he also claimed a 1st and 2nd national ace pigeon title in this category. And he also went on to win the 1st national ace pigeon title longer middle distance old birds. He also added a national victory in the yearlings' Châteauroux III to his palmares this year, which shows that he did have an exceptionally successful 2018 season indeed. As with most fanciers, expectations were high for team Clicque at the start of the season. They had 250 racing birds played both in classic widowhood and total widowhood, as well as a group of long distance hens raced from the nest. This means they had quite a bit of work to do to get their team up and runnnig. An additional 250 youngsters are weened, and these complete four national young birds' races. The youngsters will be ager to be transferred to a new loft in 2019, when the existing team of old and one year olds has been reduced by half: they kept about 50% of the 250 racing birds after a demanding season. Continue reading to find out how the racing team did season. 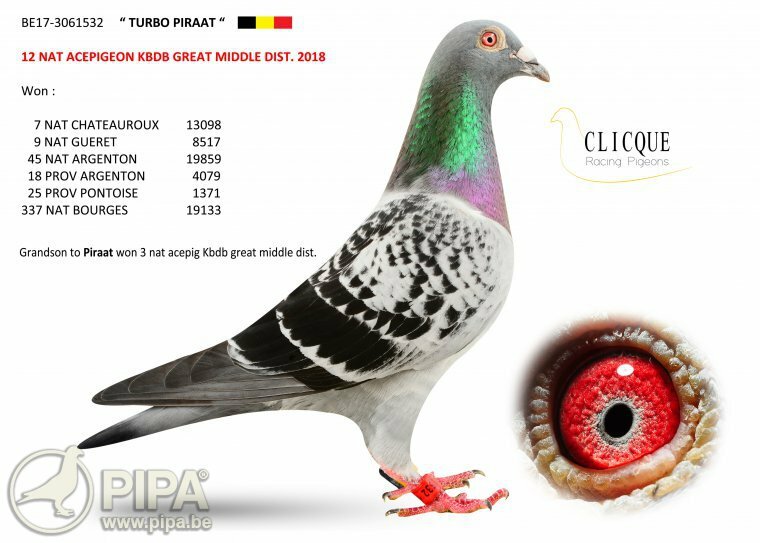 If a reporter were asked to write about the 2018 season of the Clicque Racing Pigeons, he would need pages and pages to summarise the countless top prizes that they have won over the course of this year. Instead, we came up with this list of achievements for 2018, which needs no further explanation. After several years in the sprint and the middle distance, with 10 provincial first prizes from Bourges in 15 years' time, the team decided in 2009 to shift their focus towards the long distance competition. In 2010 they became 2nd national ace pigeon longer middle distance with 'Super Prince'. Two years later, the team of Gino Clicque wins the title of national long distance champion with the help of 'Piraat' and the two brothers 'Pacha' and 'Ronaldo'. 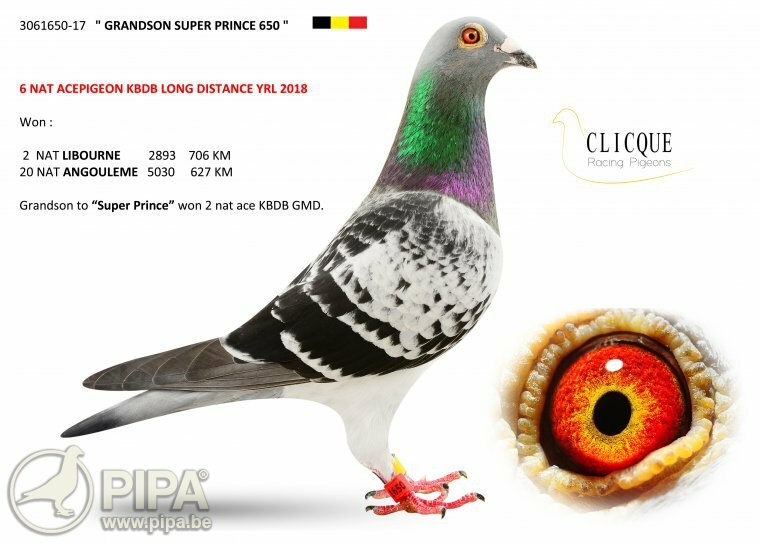 The team continued to win national top prizes one after another, and several titles were won along the way as well: Golden Prince became 1st National Ace Pigeon KBDB long distance yearlings in 2014, and Golden Princess claimed the title of 1st National Ace Pigeon KBDB yearlings long distance in 2017. In 2018, Gino won the national championship title yearlings extreme long distance and long distance. Gaby Vandenabeele from Dentergem (Bliksem and Rudy). Gino obtained 20 birds in 2013, and they have given 3 national winners already. 4th nat. Tulle of 5326 p.
5th nat. Limoges of 7326 p.
27th nat. 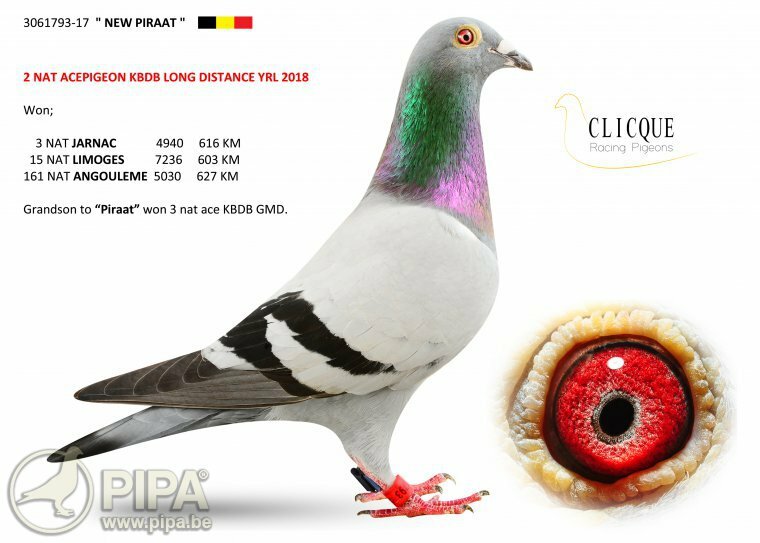 Jarnac of 4940 p.
Grandfather: BE-3188928 Piraat, winner of 3rd national and 1st provincial ace pigeon middle distance in 2008. He also won a 5th nat. Bourges of 19084 pigeons and a 4th prov. Tours of 3135 pigeons. Grandmother: BE08-3172901 Nestsister Super Prins, winner of a 136rd prov. Argenton of 2550 pigeons and a 105th prov. La Souterraine of 2838 pigeons. For the full pedigree click here. 3rd nat. Jarnac of 4940 p.
15th nat. Limoges of 7326 p.
161st nat. 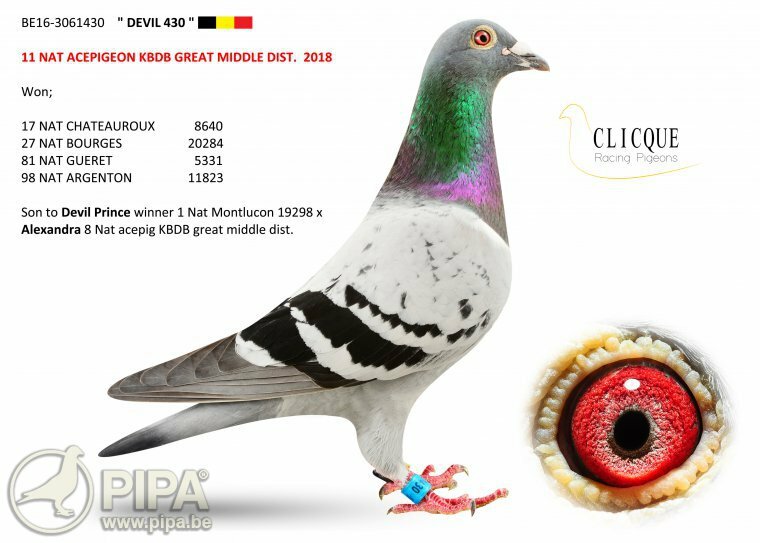 Angoulème of 5030 p.
Grandfather: BE-3188928, winner of a 3rd national and 1st provincial ace pigeon title middle distance 2008. He also wins a 5th nat. Bourges of 19,084 pigeons and a 4th prov. Tours of 3135 pigeons. 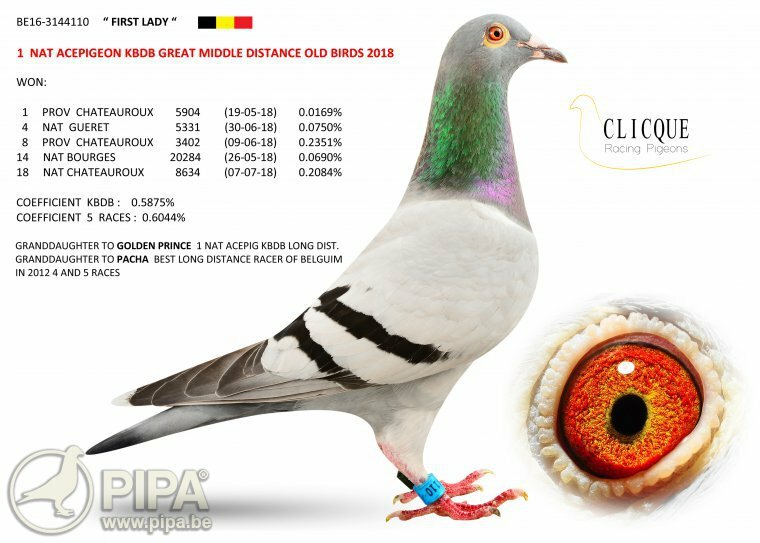 Grandmother: BE11-3008432 Belgium Princess: a daughter of the best two pigeons of Belgium in 2010: Super Prince and Miss Belgium. Grandfather: BE10-3086721 Superbolt Nestbroer, winner of a 5th prov. Clermont of 8375 pigeons. Grandmother: BE13-3036225 Gaby Returned Bliksem 225. She is also the dam of Ida, winner of a 4th and 7th prov. Chateaudun in 2015. Gaby Returned Bliksem 225 was a 100% Gaby Vandenabeele and a granddaughter of the legendary Bliksem. Click here for the full pedigree. 3rd nat. Angoulème of 5030 p.
26th nat. Brive of 4384 p.
430th nat. Limoges of 7326 p.
Grandfather: BE08-3127821 Pacha: the best pigeon in the one day long distance in 2012, and winner of 17 top prizes, including a 27th nat. Soullac of 7760 pigeons. Grandmother: BE11-2201964 Van Eycken, a daughter of a 4th Nat. Ace Pigeon long distance. Grandfather: BE12-3050299 Hikker Piraat, winner of a 9th nat. Fontenay of 4802 pigeons. Grandmother: BE12-3112488 Kurt DV, an original Kurt and Raf Platteeuw. The full pedigree can be found here. 20th nat. Limoges of 7236 p.
19th nat. Brive of 4384 p.
170th nat. Angoulème of 5030 p.
Sire: BE11-3008153 Red Flip won a 2nd nat. Cahors of 7140 pigeons and a 6th nat. Soullac of 5282 p.
Dam: BE15-3050534 Marriot, 5th prov. ace pigeon long distance with a 35th nat. Chateauroux of 17,250 pigeons. Grandfather: BE11-3172003 Mario: winner of a 1st nat. Limoges of 7721 p.
Grandmother: BE13-3047545 Danielle: winner of a 22nd nat. Perpignan of 5254 p.
For the full pedigreee click here. The old birds did great in the longer middle distance competition as well, and it resulted in a 1st national ace pigeon title with Golden Princess, as well as an 11th and 13th place. 1st provincial Châteauroux of 5904 p.
4th national Gueret of 5331 p.
14th national Bourges of 20,284 p.
8th provincial Châteauroux of 3402 p.
18th national Châteauroux of 8634 p.
Grandfather: BE08-3127821 Pacha: the best pigeon in the one day long distance 2012 and winner of 17 top prizes, including a 27th nat. Soullac of 7760 pigeons. Grandmother: BE12-3000440: Zidane Devos: from the line of Etienne Devos's Zidane and Gaby Vandenabeele's Wittenbuik. Grandfather: BE13-3031767 Golden Prince, 1st nat. ace pigeon long distance. Winner of a 3rd nat. Brive of 3850 pigeons, a 4th nat. Tulle of 5731 pigeons and a 14th nat. Limoges of 6907 pigeons. For the full pedigree, click here. 17th nat. Châteauroux of 8640 p.
27th nat. Bourges of 20284 p.
81st nat. Gueret of 5331 p.
98th nat. Argenton of 11823 p.
Grandfather: BE12-3162870 Super Gaby, sold for 81000 euro; a grandson of Gaby Vandenabeele's Bliksem. Dam: BE14-3028139 Alexandra, winner of a 5th nat. zone A Argenton of 4732 p.
23rd nat. Bourges of 20284 p.
29th nat. Châteauroux of 8640 p.
6th  prov. Bourges of 501 p.
18th prov. Fontenay of 7321 p.
40th prov. Châteauroux of 5904 p.
7th nat. Chateauroux of 13098 p.
9th nat. Gueret of 8517 p.
45th nat. Argenton of 19859 p.
337th nat. Bourges of 19133 p.
Grandmother: BE07-3038761 Chris; the dam of a 1st nat Chateauroux II of 22178 pigeons and the grandmother of Golden Princess, 1st nat. ace pigeon long distance. BE17-3061560: Golden Devil : 1st national Châteauroux II of 12,942 p.
Sire: BE-3160367 Just Argenton Boy: winner of a 59th nat. 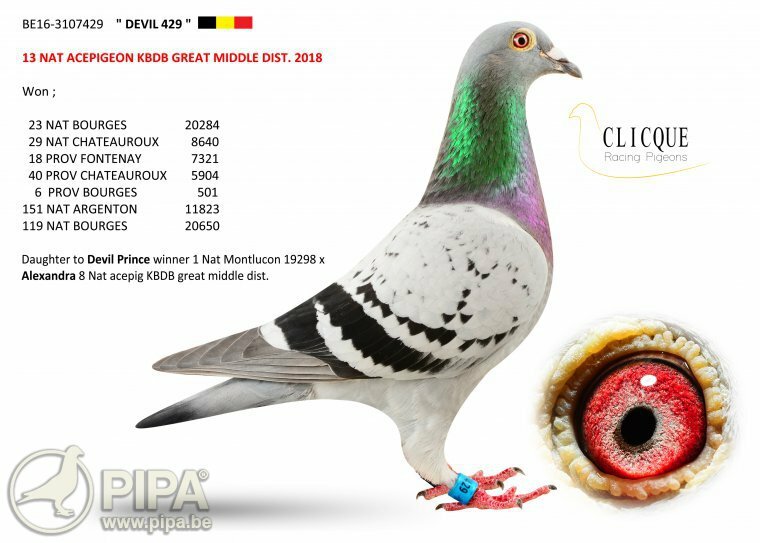 Brive of 5951 p. and an 82nd nat Limoges of 6492 pigeons. This bird was auctioned to Rudi de Saer, who showed to have an eye for talent. Dam: BE15-3050622 Ida, winner of a 4th Interprov. Chateaudun of 4579 p. and an 8th prov. Chateaudun of 2587 pigeons. Click here for our previous report on Golden Devil. Getting so many great results is quite an achievement; the sky is the limit for the Clicque Racing Pigeons.